Fake Beef Seized in China -- Coming Soon to a Dog Food Near You? 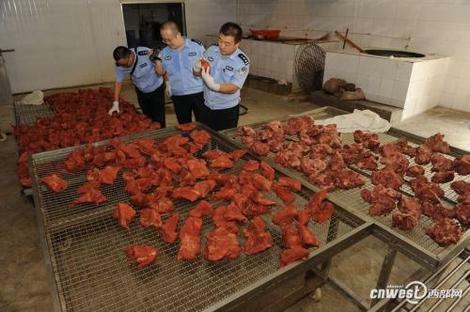 Fake Beef Seized in China — Coming Soon to a Dog Food Near You? September 19, 2013 — This week, police in the Shaanxi province of China reported they had discovered and seized more than 44,000 pounds of fake beef at a local factory. According to an article published by Shanghaiist, the bogus beef was made from pork that had been treated with paraffin and other industrial chemicals. The idea was to take considerably cheaper pork and make it look more like it came from more costly beef cattle. According to that same report, one gang of meat crooks had already earned $1.6 million by selling rat, fox, and mink meat to unsuspecting customers. This news of this event is just one more reason we continue to recommend pet owners avoid buying dog food made with plant or animal protein ingredients imported from countries known for their inferior food standards. Our new Editor’s Choice section is designed to help you find 4 and 5-star pet food companies that avoid using meat ingredients from these questionable — and risky — food sources. The new section should be available to readers sometime during late Fall 2013.